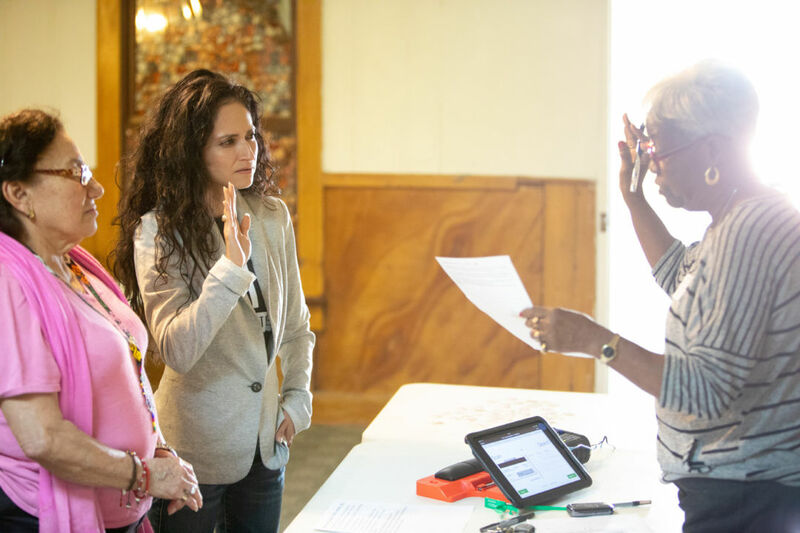 Jenny Ceballos is sworn in as a voting assistant to help Maria Barcenas cast her ballot. Barcenas drove to the wrong polling location and Ceballos then drove her to her correct polling location in Trinity Garden. 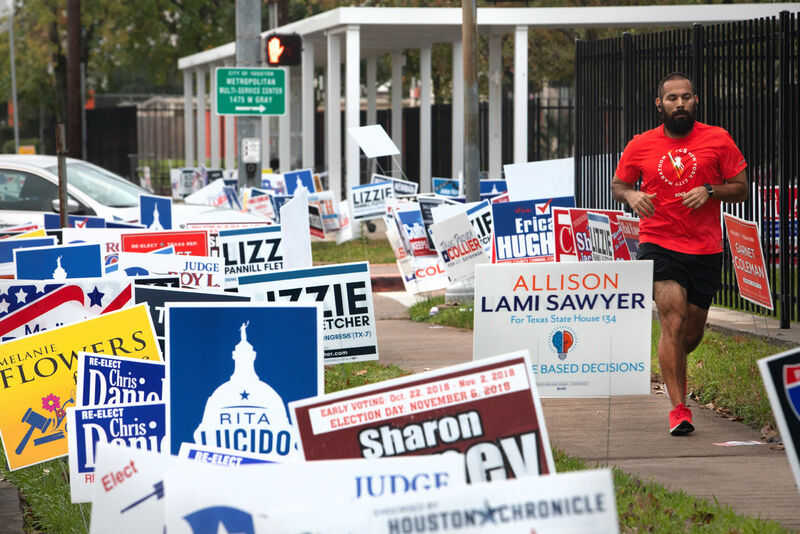 Standing outside the Ripley Center, a polling place on Navigation Avenue, on Tuesday morning, the photographer Daniel Kramer watched as an older Hispanic lady maneuvered her car into a parking spot, a confused expression on her face. He was already moving toward the woman, mentally composing the image he was going to photograph for his Houstonia Election Day coverage when Jenny Ceballos, a Beto O’Rourke supporter who had stationed herself outside the Ripley Center to pass out flyers as people headed into the polls, stepped up and started talking to the woman, Maria Barcenas, in Spanish. Kramer couldn't follow their conversation, but he sidled up and kept shooting while Barcenas told Ceballos that she wasn’t sure where to vote so she had come to the Ripley Center hoping they could help her figure it out. 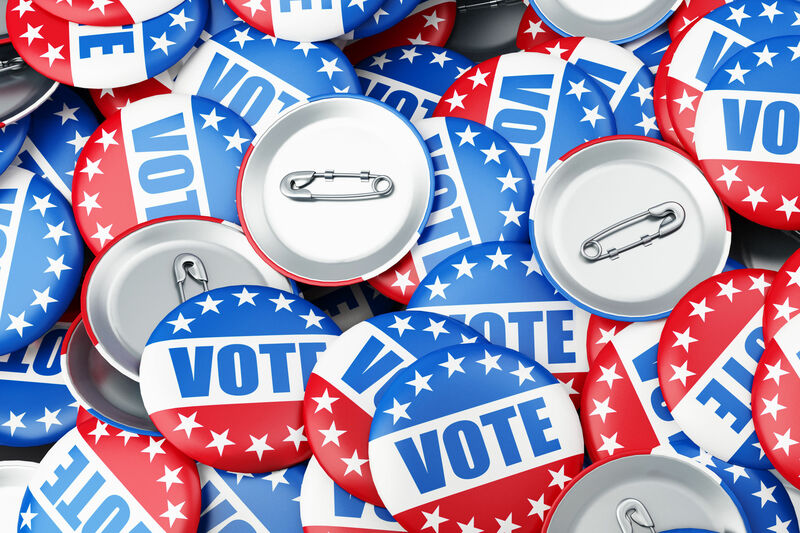 "She told me she was going to try and vote, but if it wasn't going to be here where she volunteers regularly and knows people then she wasn't going to vote at all," Ceballos says. "So I offered to help her." Ceballos, a realtor and a seasoned political volunteer who has been backing Democratic campaigns since she was a kid growing up in Houston, pulled out her phone and found the correct voting location in Trinity Gardens, but just as she was about to look up directions to the place, her phone died. Ceballos had been so focused on figuring out how Barcenas could vote, she’d barely registered Kramer snapping photos of the entire exchange, but when her phone died she immediately turned to him and asked if she could borrow his cell phone to pull up a map to the place. "I was surprised, since that's not a thing people really do to someone they don't know, but I went with it," he says. 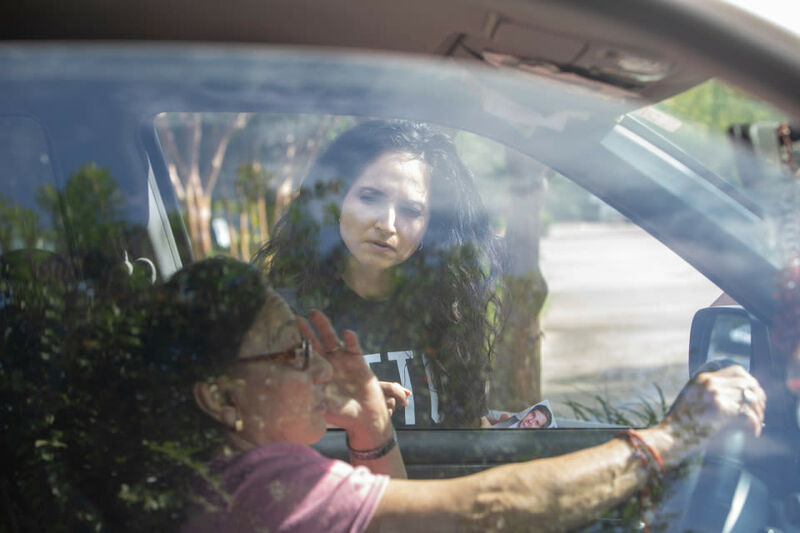 Beto supporter Jenny Ceballos helps Maria Barcenas who found herself at the wrong polling location. Kramer handed Ceballos his phone, and she quickly pulled up a map showing Barcenas the location she would take her to, promising that even though the map said it would take 17 minutes, they could get there in 10. Barcenas hesitated, telling Ceballos later that she has never been the kind of person who would get into a stranger’s car, but she did want to vote. Ceballos was staring at the map one more time, trying to memorize the directions—she didn’t have a charger with her—when Kramer offered to come along for the ride. Within 20 minutes of meeting the three strangers found themselves piled into Ceballos's car and heading toward Trinity Gardens. When they arrived, Barcenas asked Ceballos if she could help her work the voting machine, and Ceballos, knowing that she couldn't do so while wearing her Beto shirt, pulled a sport coat from the back of her car to cover it up, went in, and asked the election judge to swear her in so she could assist Barcenas. It took a few minutes to find the right paperwork, but soon Ceballos and Barcenas were standing in front of the election judge, while Kramer photographed the swearing in. 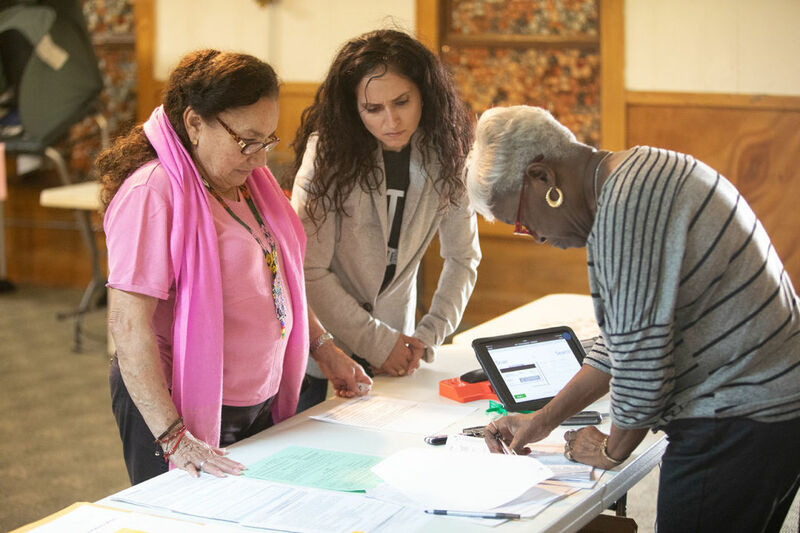 Maria Barcenas and Jenny Ceballos wait while a Trinity Gardens election official finds the paperwork to swear Ceballos in as an aide to Barcenas. The election officials told Kramer he’d have to leave since a voter was now present, so he waited outside while Barcenas cast her ballot. “I guess I was supposed to be at the poll to meet you today,” Ceballos told Barcenas as they walked out of the polling location and the trio headed back to the car. By noon Barcenas was back at her car at Ripley Center, but that wasn’t the end of the ride for Kramer and Ceballos. 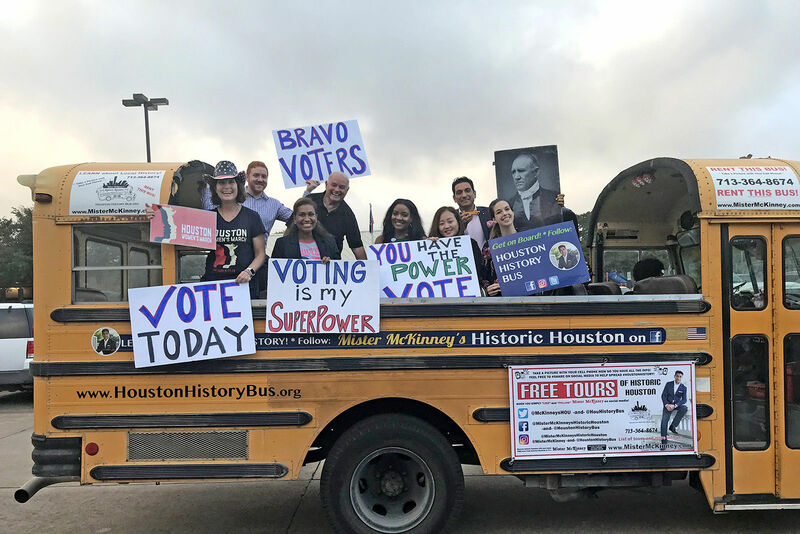 The two headed to polling locations over in Sunnyside, with Kramer keeping an eye out for more pictures that would convey what the 2018 midterms had really been like in Houston on Election Day, and Ceballos looking to assist anyone who might be confused about how or where to vote. “I’ve been volunteering for a long time, and I’ve seen people get discouraged and give up on voting because they don’t understand something or simply don’t know where to go, so I wanted to be there to help,” she says.